You can expect that things are going to change in NFL betting over the next month. After seven weeks of watching the biggest favorites clean up at the window, Vegas had to have bottomed-out last week when favorites went 10-2-1 against the spread with all of the biggest favorites covering easily. Not only did every square with a ticket likely cash in on Sunday, but also the lack of any true upsets outside of Arizona beating the Giants (man, did the books need that one) means that an overwhelming majority of teasers, parlays, and other high-odds tickets were punched. That also means that the books took a bath. And while I couldn't be happier about sportsbooks getting taken to the cleaners, I also know that we football bettors are going to start paying for it with comical lines. But we'll worry about that soon enough. - That's now a 6-0 ATS start for both New Orleans and Denver. St. Louis in 1999 (6-0 ATS), Minnesota in 2003 (6-0 ATS), New England in 2007 (8-0 ATS), and Tennessee in 2008 (7-0 ATS) are the only other four teams over the last 10 years that have pulled that off. - Sunday was the most comfortable I have ever been in my life laying more than two touchdowns (15.5) in an NFL game. Was there any doubt that Tampa Bay would be overwhelmed and ill equipped to handle a trip to London? Raheem Morris is a train wreck. But fortunately for him there are so many other awful coaches in the NFL that he's kind of under the radar. - At first I thought that Mike Singletary's move to Alex Smith out of halftime was a joke. I thought it was making a move just for the sake of making a move. But he more I thought about it the bottom line is that I loved Singletary's moxie for simply making a move and not giving a damn about the repercussions. Too many NFL coaches are frozen by the fear of second-guessing and criticism that they often play it too conservatively or simply ignore obvious decisions. Smith is better equipped to handle a pass-happy attack and potential comeback. It was a good move, and not just because it worked out. Even if Smith hadn't played well I have to commend the Niners coach for having the stones to make a move. - If Rashard Mendenhall wants to continue to be the Steelers primary running back he absolutely has to hold onto the ball. Two fumbles in two games won't cut it. - Richard Seymour after Sunday's game: "I don't' think we could've beat an Oakland high school team." That's a far cry from his playoff predictions leading up to the game. And I can't believe I didn't at least make a small play on the Jets going into that one. Just stunning how many people flocked back to Oakland at the betting window after one measly, fluke win over Philadelphia. - Tom Cable, just leave already. He finally came to his senses with JaMarcus Russell, benching Russell after he turned the ball over three times in his first 17 plays. That included a fumble on the first play of the game, at his own four-yard line, which resulted in a Jets touchdown less than two minutes into the game. I have spent the last three days wondering if Russell is the worst NFL quarterback that I've ever seen. I am not prone to hyperbole so I'm not just going to throw that out there. However, Russell is clearly in the discussion. Well, Cable is going back to Russell this week under center. The reason he gave is that he doesn't think that Bruce Gradkowski or Charlie Frye are the answer at quarterback. I just have nothing to say to that level of rampant stupidity. - With 30 seconds left in the half the Dolphins were up 24-3 on New Orleans. With 14 minutes left in the third quarter - just about a minute-and-a-half game time later - it was 24-17. This Saints team is just no joke. - Which was a worse beat: New Orleans returning an interception 54 yards for a touchdown with under two minutes to play, capping a 22-0 fourth quarter and spoiling an outstanding effort from Miami, to win by 12 against a 6.5-point line, or Pittsburgh returning not one but two Minnesota turnovers 77 and 82 yards for defensive touchdowns in the last seven minutes (the last coming with 1:15 to play) to spoil the cover for the Vikings on a line that was likely anywhere from 4.0 to 6.0? I really can't decide, but if I HAD to pick I would go with the New Orleans game. No way did Miami not deserve the cash in that one. But as Clint Eastwood, a.k.a. William Munny said, "Deserves got nothin' to do with it." - Double-digit favorites are now an incredible 13-4 against the spread on the season. I put action on both Indianapolis and New England but I am still hesitant to pound these lines and these situations. It is the NFL and we're talking about Vegas oddsmakers. In the end, things have to even themselves out, statistically, right? Unfortunately it's that type of thinking that has been keeping me, personally, from just absolutely cleaning up this year. But hopefully my measured approach will also prevent a collapse when the pendulum eventually does swing the other way. - Until further notice the Monday Night Football game is an automatic play on the 'over'. Teams are now 7-1 against the total so far on Monday nights this year. And even though the Atlanta-New Orleans total for next week is 54.0, the highest total of the season and in a range where the 'under' has hit about 80 percent of the time over the last 15 years, I still think that the play has to be on points, points, and more points. - Anyone who is suddenly stunned by Chicago's struggles just hasn't been paying attention. They had been outgained in four straight games heading into Cincinnati and had been playing progressively worse on the offensive line and defensive front seven. And not to keep beating a dead horse, but that's exactly why I railed against the Jay Cutler trade in the offseason: they gave up way too much to make a negligible move up the quarterback ladder. They gave up three draft picks (two No. 1's and a No. 3) that could have been used to shore up those deficiencies. Had they held onto their picks they could have possibly grabbed Michael Oher and Rey Maualuga last April and still have been sitting on a first round pick this year. Instead, they got Cutler. I am clearly on the record as saying that I'm not a Cutler fan in any way. However, even I am not blind enough to see that he is doing everything he can with that substandard offense. He simply is not getting time to throw. And when you take a questionable decision maker and don't protect him the result is going to be 10 interceptions in six games. - Just a gutless, classless act by Marvin Lewis to A) leave Cedric Benson in during the fourth quarter of a 45-10 game and B) go for it on fourth-and-four at the end of that same game. Lewis is a joke to me. He is a dreadful coach and I'm certain he will find a way to blow this promising season. The Bengals are loaded with talent on both sides of the ball and the only thing that will keep them from the postseason would be Lewis. I have faith that the players can get it done. But Lewis's act on Sunday just once again shows that he doesn't get it. - I've been saying it all year and it played itself out once again on Sunday night: Arizona's front seven is the most underrated group in the league. This is not the same pushover group that you've seen the past couple of seasons and I actually think that they have gotten considerably better now that former defensive coordinator Clancy Pendergast has moved on. This team stood tall against the Giants, including several key short-yardage stops, and were the real reason for their solid upset win in the Meadowlands. - Is it time for the Giants to start panicking? Well, it's New York so there will always be panic directed toward the sports teams. But considering that the G-Men haven't beaten any likely playoff teams and, in fact, have fattened up against the worst of the worst, back-to-back losses against New Orleans and Arizona have to raise some eyebrows. That said, I still have nothing but confidence in this Giants team. They have played too well for too long over the past several seasons not to think that they are still the class of the rugged NFC East. - Naturally, I trashed Buffalo's special teams last week and then they came out and had their best game of the season against Carolina. Part of that is due to the Panthers having one of the worst units in the league. But the bottom line is that Bobby April got his boys playing on Sunday. - I guess Houston is legit. And if they aren't, they are becoming more legit by the second. This team is just a couple plays away from potentially being 5-1. Their offense is clicking - it's amazing what a team can do when its quarterback actually stays healthy, eh? - and their front seven is playing better and better each week. However, their secondary is still woefully inept. It is a major weakness and Peyton Manning should absolutely shred them when these teams get together. That said, San Francisco is a very physical team. And in the first quarter of that game the Niners were actually the more aggressive unit. But I loved the way that Houston countered that with execution and scheme. And once they took an early barrage from San Fran at the point of attack, and were still in the lead, you could see the Niners sag and the Texans gain confidence. - I've always been a big Jacoby Jones fan. In past Ferringo Reports in previous seasons I've been screaming for Houston to get him more involved. I'm glad to see he's having somewhat of a breakout season. - I am still stunned each week that teams don't realize what Minnesota is going to do on any critical third- or fourth-and-short situation. When the Vikings absolutely, positively need to gain one, two, three or even four yards they are going to run the ball off-tackle behind the left side of their line. I love that they keep it simple - give it to their best player, Adrian Peterson, and let him move behind their other best offensive players, Steve Hutchinson and Bryant McKinnie. But on the other hand I am stunned that opponents haven't caught on to this yet and started stacking extra linemen and linebackers on that side of the ball. - I still cannot wrap my head around the ATS disparity between the top and bottom teams this NFL season. Over the last six years there has been about an average of five teams per season that lost 10 games or more against the spread. The high came in 2004-05 when there were seven teams that were that awful at the window and one of the big reasons for that anomaly was a combined 25-38-1 ATS mark out of the mess in the NFC West. This year there are already nine teams on pace for 10 or more losses against the spread this NFL season. And unless the books start trotting out a lot of 20-point lines I don't know if there's anything that can be done about it. - I don't think for a second that Philadelphia is "back". That win last night was gift-wrapped for this group and I don't think that the Eagles were particularly sharp in the process. I also think that they need to 100 percent scrap any Wildcat formations or anything having to do with Mike Vick. He simply is not bringing anything to the table. I thought that the best thing the Eagles could do after signing Vick was to stash him on the bench for this season, let him learn the offense and get back into some kind of shape (he still looks overweight and about four steps slow), and then come back with him strong next year. But I think that they are simply wasting time - in practice and in games - on those formations and schemes. It's not as if the Eagles have had problems on that side of the ball in this decade, other than just keeping Donovan McNabb healthy. 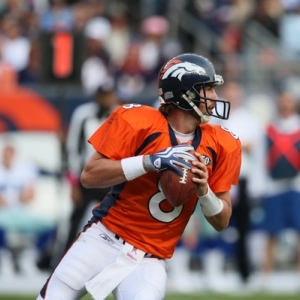 - How John Fox can keep trotting out Jake Delhomme each week is stunning to me. I realize that Delhomme went for more than 300 yards against the Bills on Sunday. But his turnovers also single-handedly ruined any hope that the Panthers had of winning (or covering) in that game. Because the Panthers can't rely on him to move the ball in the air they have entered the area where just too many things have to go right on their drives in order for them to score. This team lacks playmakers and have to resort to a methodical, grind-it-out attack to get points. The trouble is that this method only works if you have a quarterback that is accurate and takes care of the ball. Delhomme is the exact opposite. - Let's not get too excited about Green Bay. They have beaten Detroit and Cleveland in the last two weeks. Not exactly inspiring. Their offensive line is still a wreck and that is still a huge anchor around this team's neck. - Kudos to the Bengals offensive line. They are getting better and better each week. That was THE question mark on this team and they are answering the bell. - Apparently, Miles Austin is legit. And it's a good thing. Because Tony Romo actually looks like he has negative chemistry with overrated Roy Williams. - I still can't decide if Dallas is any good. On one hand they barely lost to two of the best teams in football (Giants, at Denver). On the other they are still sloppy, undisciplined, led by Wade Phillips, and can't be counted on to show up when they have to. They had two weeks to prep for Atlanta and were catching the Falcons in a Letdown/Look Ahead Situation. Oh, and Dallas was losing early. But they came around and earned an impressive win and all of a sudden are 4-2. They are the Chargers of the NFC. - Atlanta really, really misses Brian Williams and it's only been five quarters without him. You can see and feel the disorganization and uncertainty in that secondary. And I'm sure Drew Brees can see it and will feel it as well. - I don't know how Darren Sharper doesn't have the Defensive Player of the Year Award already wrapped up. I'm not even taking arguments about this one.